I was working on cmd and certainly I made changes in properties from window mode to full screen. Now every when I open a new window or existing one using win+r [cmd] I am only getting a full screen cmd prompt. Please provide me the solution to restore it in previous mode [window mode] cmd. 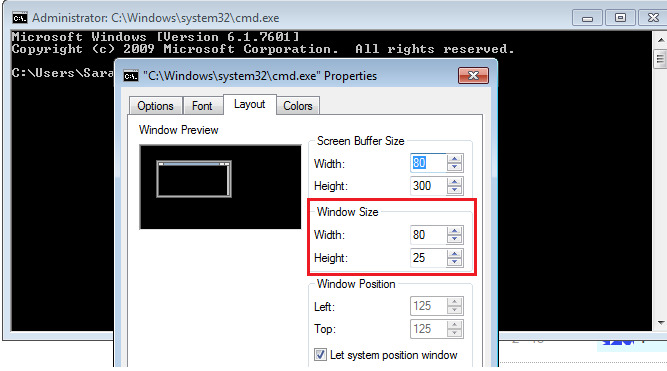 Change the Height and Width of the CMD window size. Open the CMD > Properties > Layout and change the size here. Go to the properties of shortcut cmd set run field as Normal windows in shortcut tab. In CMD run notepad to get you out of fullscreen and then right click the top left of the minimized CMD window to reach the option window as shown in the screenshot from a previous answer (vernbutech's). I ran into this problem in windows XP where the dos window covers the whole screen for all future execution of cmd. Nowhere to find the tab to click properties. None of the above works. Properties on the shortcut only works for that cmd in windows mode. If you ever run (cmd) in the run command is different from running from a shorcut in windows. I changed the properties in the shortcut but still ran full screen from the run command. The solution is to click tab key to go to another program running so that the full screen dos will be minimized at the taskbar. right click properties on the minimized dos from the taskbar and set default and you're go back to the default window size. Not the answer you're looking for? Browse other questions tagged windows-7 command-line or ask your own question. How can I always run the command prompt as administrator? How to full screen command prompt in a Virtualbox XP vm?